Sends signal right into nests within walls, ceilings and attics. 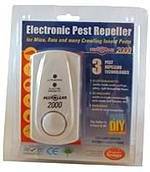 Effective against mice, rats, ants and many other pests. Also works on mosquitos, so great on holidays. Only one unit needed for average sized home.